After a dangerous head injury, a competitive bronco rider examines his life and must come to terms with what his future holds. It's hard to give up on your dreams, but sometimes life has other plans. "The Rider" is written, directed, and produced by Bonnie Award winner Chloé Zhao. This is her second feature-length film, her first being "Songs My Brother Taught Me." It stars real-life cowboys and rodeo competitors and is a fictional story based on true events. Brady, Tim, and Lilly Jandreau play on-screen family Brady, Wayne, and Lilly Blackburn. Brady had been an up-and-coming star in the bronco riding rodeo circuit, but a severe head injury stopped his rise in the rodeo world. His injury even made him suspend his day job of training horses. Brady must now find a new way to occupy his time and earn a living, or risk his health and go back to doing the thing he loves that gives him purpose. Another indie film, another slice-of-life character sketch. "The Rider" reminds us films like "The Wrestler" and "Million Dollar Baby" where athletes who once lived in the spotlight are forced to rethink their dreams due to external forces. What separates a movie like "The Rider" is a more meandering pace and a lack of dramatic family conflict, mostly because it doesn't actually star any actors. These are real people who have (almost entirely) led the lives being shown on screen. We have seen this tactic implemented before in movies like 2012's "Act of Valor" and in Clint Eastwood's 2018 film "The 15:17 to Paris." It seems like filmmakers do this in order to capture a more authentic feel, though the desired effect is not always achieved. Because the people in this film are not actors, it often results in wooden performances that lack nuance and emotion. Luckily, Brady Jandreau offers more inflection than the others and delivers many of his scenes convincingly. The same cannot be said for other people like Tim Jandreau and Cat Clifford, who sound like they are reading directly off the page. That being said, we do appreciate Chloé Zhao hiring real people in her film. Another thing we appreciate is that some of the people in this movie are actually disabled, which is something we don't see too terribly often from Hollywood. Lane Scott, who plays himself, was an actual bull rider who had his career cut short when he was badly injured in a car accident, though we do believe the film implies Scott's injuries were the result of a bull riding incident. It is Brady's scenes with Lane that deliver the most impactful moments as we see him help Lane imagine himself reliving his glory days through intense physical therapy. 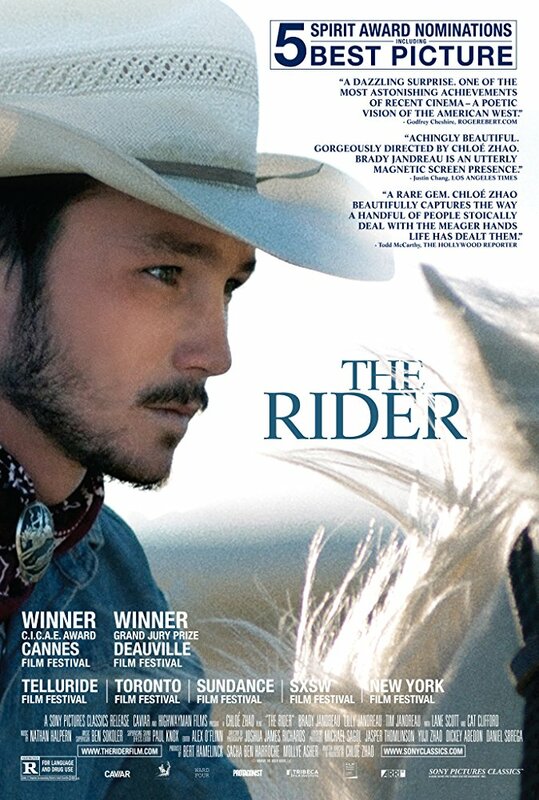 It seems the main purpose of "The Rider" is to explore how mundane Brady's life has become post-injury. Since he can no longer participate in any competitions, and since he can't train horses anymore, and since he can't even ride them without the looming threat of permanent damage, his entire life must be altered because being around horses is all he's ever known. With no education and few skills beyond horse riding and rearing, Brady is now forced to work a boring 9-5 as a clerk at a grocery store. The horror! We get to follow his humdrum journey every step of the way, and for some, that may be enough. BigJ found himself looking for something a little more hard-hitting and emotional than what he got here. For me, I found "The Rider" to be smart, well executed, and methodical when elongating and accentuating the mundanities of life in South Dakota for one man who has had to give up his aspirations all too soon. In the end, this is a very good movie, but be aware that it does drag from time to time.